Economic improvement is what we envisioned for poor Filipino families and to realize this vision, we are committed to provide livelihood opportunities for our target beneficiaries to augment their family income. 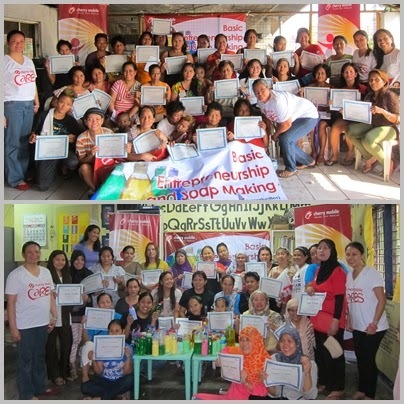 In celebration of Women’s Month, Cherry Mobile conducted a Basic Entrepreneurship and Soap Making (Dishwashing Liquid & Fabric Conditioner) training for women with diverse cultures, both Christian and Muslim communities in urban areas to empower them economically, generate their own income and eventually sustain the basic needs (proper nutrition for kids, quality education, decent housing, etc.) of their families. Over the centuries, the heads of the families had always been men and this is hinged on the fact that the family income solely come from the earnings of the father. To help society see the importance of equality for both men and women, Cherry Mobile supports women by giving them access to livelihood opportunities toward economic growth. 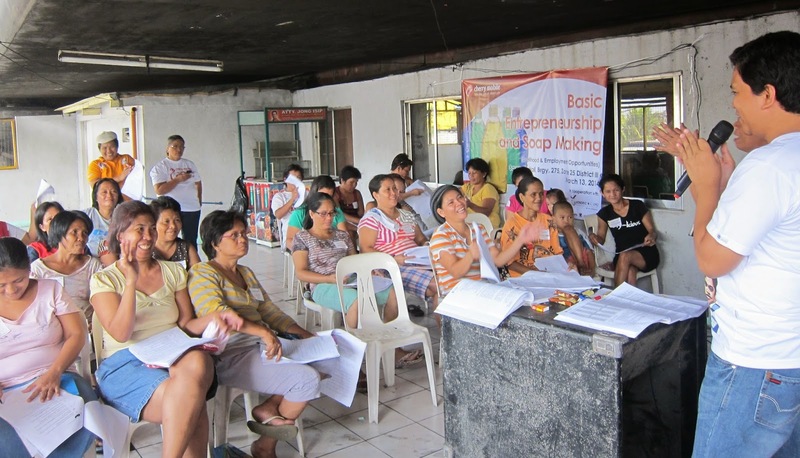 The first training was held in Brgy. 275 Delpan, Manila, to benefit mothers and adult women residing in Barangay 275. This training was in coordination with Damayan ng Maralitang Pilipinong Api, Inc (DAMPA, Inc.), a people’s organization. DAMPA aims to help solve basic poverty problems of which one is livelihood by organizing poor communities and enabling these groups to help themselves, and also by utilizing connections with the government to initiate pro-poor legislation in both local and national levels. The training was held from 9 AM to 4 PM with representatives from Honorio M.C. Lopez Technical Institute, Inc. as the main trainers for the event. Honorio is a TESDA-accredited school teaching technical livelihood skills for the less privileged local residents such as making dishwashing liquid and fabric conditioner which they demonstrated in the training. 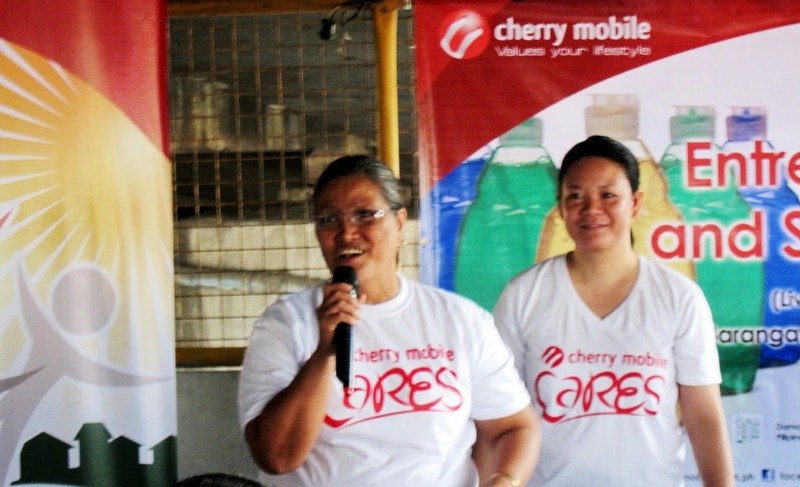 Ms. Patricia Herrera (left), Manila Coordinator of DAMPA, Inc., co-organized the event with Ms Red Penaflor-Anacay, CSR Manager of Cherry Mobile. Trainers (Ms. Eva Dagocdocan & Mr. Jackson Yngco) from Honorio M.C. 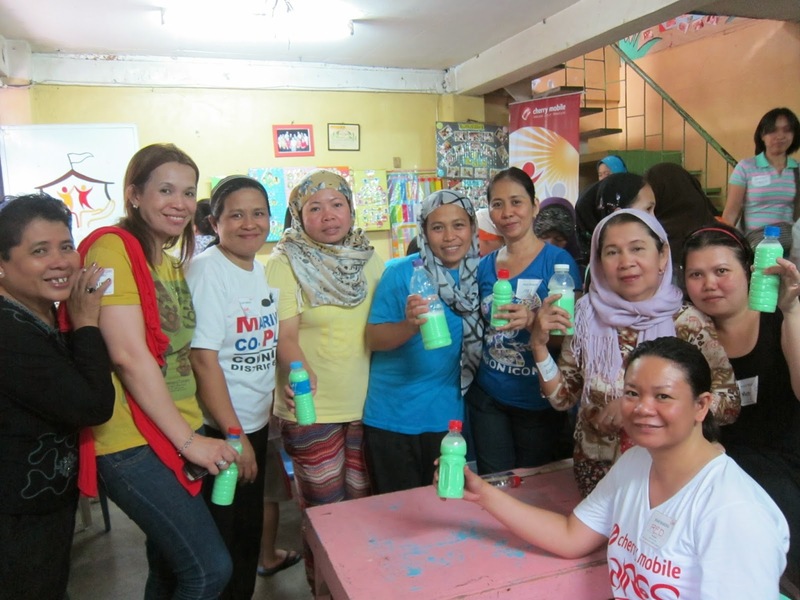 Lopez taught the participating women how to make the dishwashing liquid using simple materials which they can do at home as a start-up for micro business. Participants are glad to have samples of the dishwashing liquid which they can replicate in their own homes and sell as their own products. After the demo session, the participants were given a chance to repeat the soap making process as a group. Another similar training was conducted in the Muslim community located in Culiat, Quezon City. In cooperation with Tents of Mercy, the training benefited Muslim micro entrepreneurs who are just starting with their own business, as well as housewives who want to gain extra income given during their spare time. Tents of Mercy is a humanitarian aid center providing various social development programs and services for the needy people. Mothers and young adult women from the Muslim community eagerly participated in the whole day training. The trainers enthusiastically imparted beneficial knowledge to the participants. The ingredients and procedures for soap making. Tents of Mercy Executive Director MS. Jenny Panelo motivates the participating women to grab and maximize every opportunity there is for economic breakthrough and growth. The participants which numbered to a total of 75 women enjoyed learning a new livelihood skill and drew inspiration from the entrepreneurial talk. They gained the motivation to start a business on their own and cater to the needs of their community. Soap making can be a good means to generate income to provide for the family while still having time to keep watch over the house and the kids. A group activity followed the lively session in which each group discussed key questions in starting a micro business. As part of their training output, participants gained ideas for long term business goals. Ummi (nanay) Jamilah shares how the training gave her an idea to strengthen her current micro business. 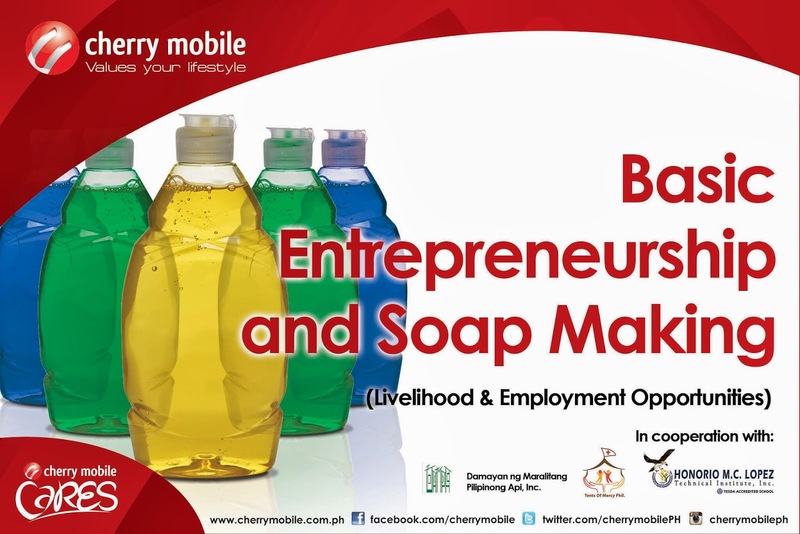 The Basic Entrepreneurship and Soap Making training is a project under the program TROPANG Cherry: Livelihood and Employment Opportunities. TRabaho at Oportunidad para sa Bawat PAmilyaNG Pilipino (TROPANG Cherry)is created by Cherry Mobile as employment assistance for the unemployed and underemployed individuals and groups who desire to acquire a decent job and attain a better quality in life. This is a collection of the soaps (dishwashing liquids and fabric conditioners in various colors) created by the participants during the whole day training. 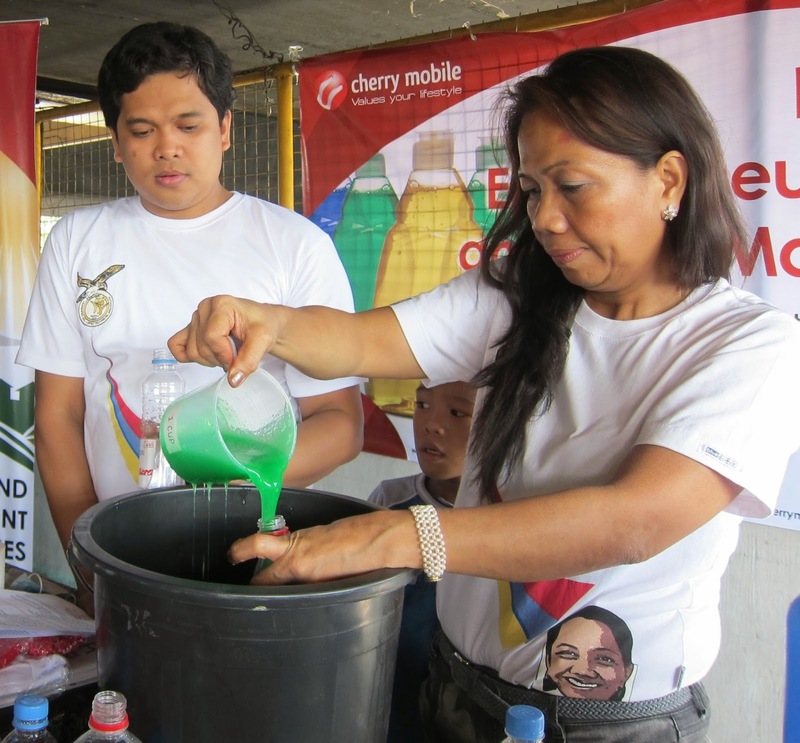 Participants had fun making soap with Cherry Mobile organizer Ms Del Geavican (left). Organizers awarded certificates to participants who completed the whole day training. One participant gladly posed before the group soap output for the day (green fabric conditioners and orange dishwashing liquids). Providing highly relevant social interventions to the unemployed and underemployed sector of society is one way to show that indeed Cherry CaRES even for those who struggle to achieve gainful employment.